The Amsterdam Mohawks walked off en route to a series opening win against the Mohawk Valley DiamondDawgs. The Mohawks are now just a win away from advancing to the PGCBL Championship Series. A John Razzino sacrifice fly scored the first run of the game in the bottom of the first inning. The Mohawks erupted for five runs in the third to take a 6-0 lead. Razzino hit an RBI double, Tommy Kain hit an RBI single, Joe Purritano hit a 2-RBI double and Joey Aiola hit an RBI double of his own down the right field line. Mohawk Valley started to chip away at the deficit in the top of the fourth as Trey Stover hit an RBI single to center field. The DiamondDawgs added two runs in the fifth inning on an error and a Gus Craig sacrifice fly. Amsterdam’s Joe Purritano made it a 7-3 game with his second RBI double of the game in the bottom of the fifth. Mohawk Valley’s big inning came in the top of the eighth when the visitors scored four runs to tie the game at seven. Jayson Sullivan hit a sacrifice fly for the first run and Eric Strano hit a bases-clearing, 3-RBI double to score the remaining three runs. 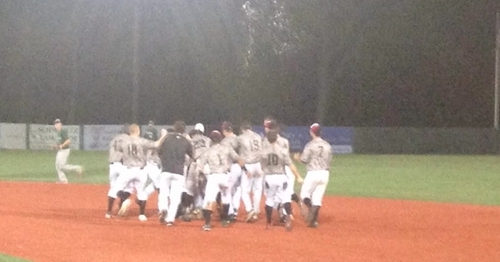 Alex DeBellis delivered the walk-off hit for the Mohawks. After John Razzino walked and stole second and third to lead off the inning, Tommy Kain was intentionally walked and stole second base to put runners at second and third with no one out for DeBellis. The Amsterdam catcher sent the Mohawk faithful home happy with an RBI infield single that scored Razzino and gave Amsterdam game one of the best-of-three series. John McCarren tossed a scoreless top of the ninth to pick up the win for the Mohawks. Lucas Godlewski tossed 5.1 innings of relief, but took the loss for Mohawk Valley. Game One of the West Division Finals between the Elmira Pioneers and the Newark Pilots was postponed due to field conditions. It will be made up tomorrow, as the entire series moves back a day. Game Two is scheduled for Sunday in Elmira and Game Three, if necessary, would be in Newark on Monday. After the Amsterdam Mohawks walked off to a game one win over Mohawk Valley in Game One of the East Division Finals, the two teams will meet again on Saturday night, this matchup in Little Falls. First pitch is scheduled for 7:05 p.m. The Mohawk Valley DiamondDawgs will return to the friendly confines of Veterans Memorial Park with hopes of tying the East Division Finals at one game apiece. The DiamondDawgs went 17-7 at home this season, compared to just 9-12 on the road. Amsterdam was actually a half-game better on the road this season (18-5), compared to an 18-6 record at Shuttleworth Park. In game one of the West Division Finals, the Elmira Pioneers will travel to Newark to face the Pilots at Colburn Park. First pitch is scheduled for 7:05 p.m. The game was originally supposed to be played last night, but was postponed due to field conditions caused by rain and hail. In a rematch of the West Division one-game playoff from the 2013 playoffs, the Elmira Pioneers will face the Newark Pilots in the post season, this time in the West Division Finals. The two teams were tied for first place heading into the last day of the regular season, but Newark won the division with a win and two Elmira losses. Elmira won the season series, 7-5, and went 4-2 against the Pilots at Colburn Park. Overall, Newark went 16-9 at home this season.